Dr. Sue Stover (far left) with members of the J.D. Wheat Veterinary Orthopedic Research Laboratory. Halls of Fame aren’t just for elite athletes or musicians—they are for ground-breaking researchers like Dr. Susan Stover as well. A professor of veterinary anatomy, Stover was notified this week that she has been selected for induction into the University of Kentucky Equine Research Hall of Fame. 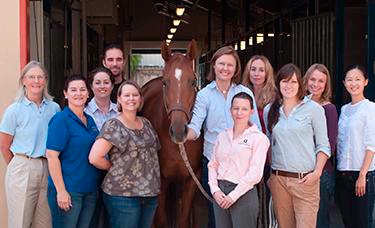 This prestigious award honors scientists who, through many years of research, have contributed significantly to the field of equine veterinary science. The Equine Research Hall of Fame is located in the Maxwell H. Gluck Equine Research Center in Lexington, Kentucky. The Hall of Fame was established to honor individuals who have dedicated their careers to expanding the body of knowledge of equine science through their contributions to basic or applied research. The award is a tribute to renowned scientists from around the world and serves as an international forum for honoring top achievements in equine health research. As director of the school’s J.D. Wheat Veterinary Orthopedic Research Laboratory, Stover is described as having had a transformative effect on the understanding of the pathophysiology of catastrophic musculoskeletal injury in performance horses, and is known for charting new and sustained improvements in the welfare of these horses and the practice of veterinary medicine. Catastrophic fractures in racing horses continue to be a major welfare issue, and her research contributions have had an international impact and have influenced decisions on approaches to training and rehabilitation, horseshoeing, track surface types and preparation, diagnostic approaches, and fracture repair techniques for improving racetrack safety for horses and jockeys. Her career research record spans many aspects of comparative orthopedics, with a primary focus on bone development and remodeling, the response of bone tissue to exercise and the pathogenesis of fractures and ligament injury. Stover graduated from Washington State University in 1976 with a DVM and completed an internship and residency in equine surgery at UC Davis. She returned to UC Davis after working in private practice in Washington. She became the ninth recipient and first female surgeon to be recognized by the American College of Veterinary Surgeons (ACVS) Founders Award for Career Achievement and has been recognized by both her alma maters as a Distinguished Alumnus. An induction ceremony to mark this year’s nominees into the Equine Research Hall of Fame will be held in October in Lexington, Kentucky. Stover will also present a seminar at the University of Kentucky Gluck Equine Research Foundation.